The ACL (anterior cruciate ligament) rely on the hamstrings to stabilize the knees. 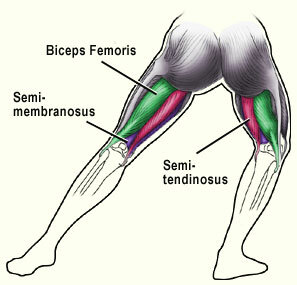 Strong hamstrings will lower your rick of an ACL injury. A study in the American Journal of Sports Medicine found that 70 percent of athletes with reoccurring hamstring injuries had muscle imbalances between their quads and hamstrings. By strengthening their hamstrings every person stayed injury free during the entire 12 month follow-up. The majority of us overuse our quads, getting up out of a chair or the toilet, walking up stairs, etc. Even those that go to the gym tend to over train the quads, I’d say most train three or more quad exercises to one hamstring exercise. You might want to take a second look at how you’re training.